structure made of glass cloth. Reinforced plastic is fabricated into a variety of cell sizes. Composite and Carbon Fiber Materials High-performance aircraft require an extra high strength-to-weight ratio material. Fabrication of composite materials satisfies this special requirement. Composite materials are constructed by using several layers of bonding materials (graphite epoxy or boron epoxy). These materials are mechanically fastened to conventional substructures. Another type of composite construction consists of thin graphite epoxy skins bonded to an aluminum honeycomb core. Carbon fiber is extremely strong, thin fiber made by heating synthetic fibers, such as rayon, until charred, and then layering in cross sections. Q4-6. Materials currently used in aircraft construc- tion are classified as what type of materials? Q4-7. What are the most common metallic materials used in aircraft construction? Q4-8. What are the nonmetallic materials used in aircraft construction? FIXED-WING AIRCRAFT LEARNING OBJECTIVE: Identify the construction features of the fixed-wing aircraft and identify the primary, secondary, and auxiliary flight control surfaces. The principal structural units of a fixed-wing aircraft are the fuselage, wings, stabilizers, flight control surfaces, and landing gear. Figure 4-5 shows these units of a naval aircraft. NOTE: The terms left or right used in relation to any of the structural units refer to the right or left hand of the pilot seated in the cockpit. FUSELAGE The fuselage is the main structure, or body, of the aircraft. It provides space for personnel, cargo, controls, and most of the accessories. The power plant, wings, stabilizers, and landing gear are attached to it. 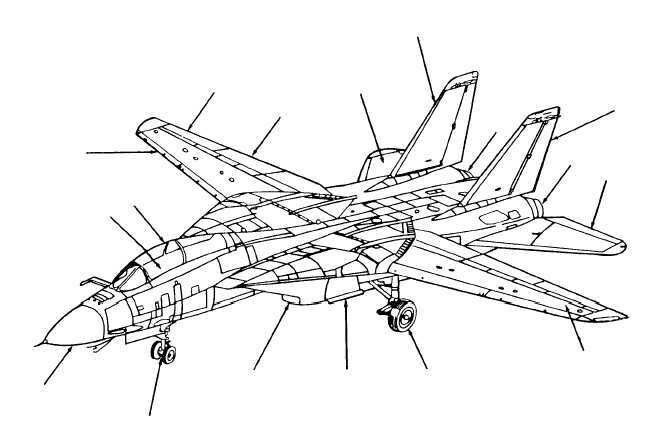 4-5 ENGINE NACELLE HORIZONTAL STABILIZER MAIN LANDING GEAR WING NOSE LANDING GEAR RADOME CANOPY AILERON LEADING EDGE OF WING FLAP ENGINE EXHAUST RUDDER ENGINE EXHAUST VERTICAL STABILIZER (FIN) ENGINE AIR INLET FAIRING ELEVATOR COCKPIT ANf0405 Figure 4-5.Principal structural units on an F-14 aircraft.